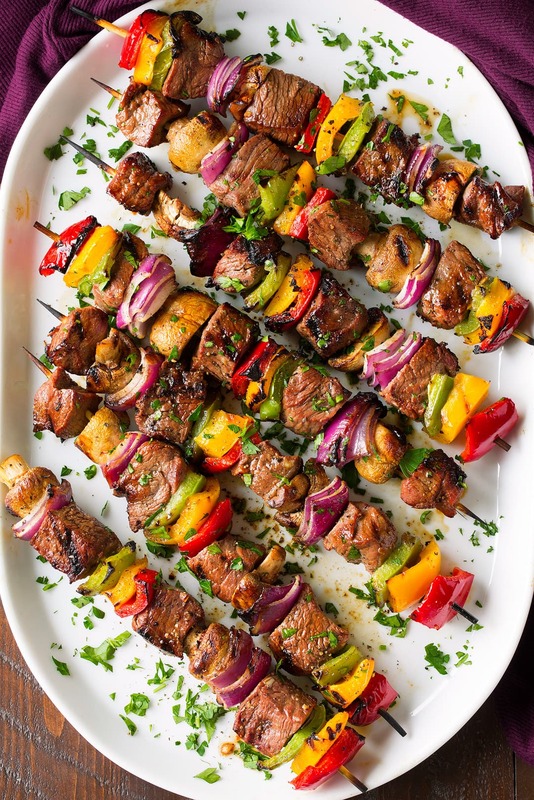 Steak Kebabs are the perfect dinner for any spring and summer meal, especially when they are marinated for hours in the most delicious marinade and paired with tons of colorful veggies like so! 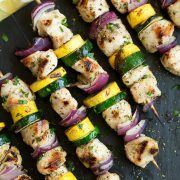 This kebabs are something the whole family will love! Steak Kebabs an Exciting Steak Recipe! 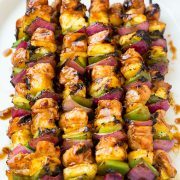 These kebabs start with the most flavorful marinade mixture and of course a fair amount of marinating time time really allows the flavors to soak into the beef. These are one of my favorite things to make when it finally starts to warm up outside, once you try one bite of the steak you’ll understand why! In a bowl mix all marinade ingredients. Place steak into a gallon size resealable bag and pour marinade over. Refrigerate 3 – 6 hours. 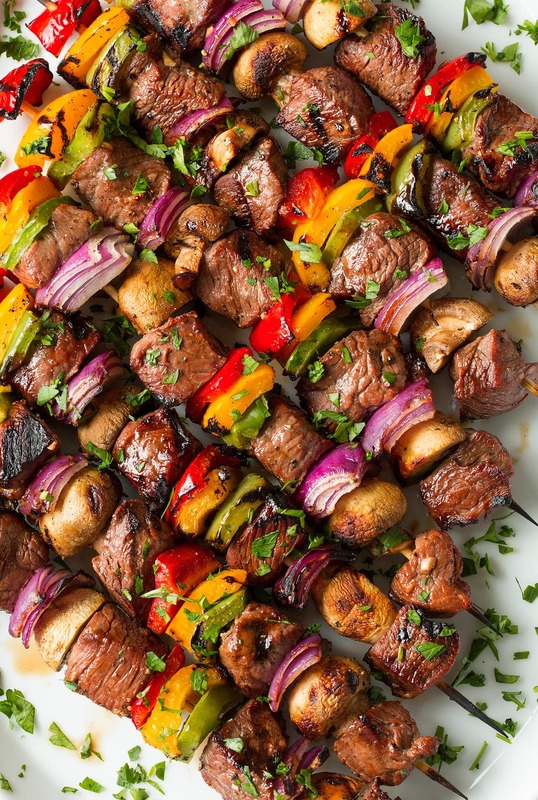 Thread steak and veggies on skewers. Brush grill grates lightly with oil. Note that your grill time may vary from what mine was so just keep a close eye on them, steak is one of those things you definitely don’t want to overcook. Cut steak cubes as uniform in size as possible so they all cook even. Don’t marinate steak more than 6 hours you don’t want mushy meat. 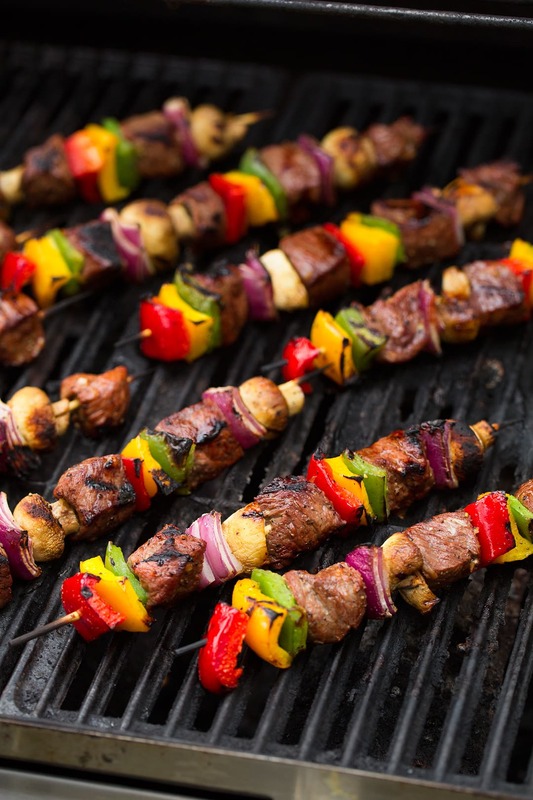 Soak wooden skewers in water when you throw the beef in the fridge that way you won’t forget to soak them. This just prevents them from burning up. Use other veggies you might already have. Squash, zucchini, cherry tomatoes, or parboiled potatoes are good choices. Now make a trip to the store and fire up your grill, you don’t want to miss out on these! 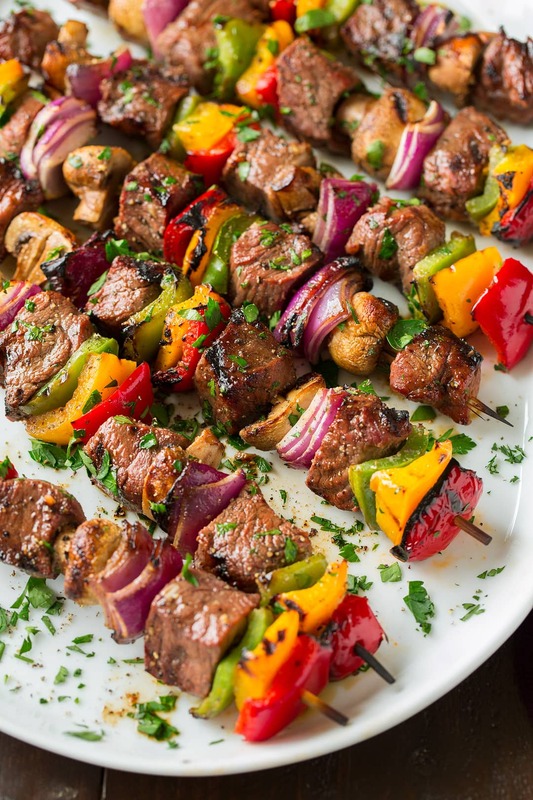 Tender, seriously flavorful steak threaded onto skewers with fresh veggies and grilled to perfection – sounds like a total win to me! One of the best steak recipes! 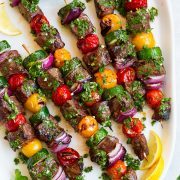 Cubes of steak are soaked in a flavorful marinade for hours to absorb flavor and make them tender, then they're threaded onto skewers with fresh veggies. It's a dinner everyone will love! In a mixing bowl whisk together all marinade ingredients. Place steak into a gallon size resealable bag. Pour marinade over steak then seal bag while pressing out excess air and message marinade over steak. Transfer to refrigerator and allow to marinate 3 - 6 hours. Preheat a grill over medium-high heat to about 425 degrees (partway through preheating clean grill grates if they aren't already clean). With veggies on cutting board, drizzle with oil and lightly toss to coat (I actually don't toss the onion because I like it to stay in chunks, when you thread the onion on layer in chunks about 2 - 3 slices so they don't burn up). Sprinkle veggies evenly with garlic powder and season with salt and pepper. To assemble kebabs layer steak and veggies onto kebabs in desired order, work to fit 4 steak pieces onto each kebab. Brush grill grates lightly with oil. Place kebabs on grill and grill until center of steak registers about 140 - 145 degrees for medium doneness, turning kebabs occasionally, about 8 - 9 minutes. Let rest for a few minutes then serve warm.